​His Excellency Vincent Meriton, Hon’ble new Vice-President of Republic of Seychelles, on his official trip to Chennai to strengthen bilateral ties in Medical Tourism between the 2 countries, visited Balaji Dental and Craniofacial Hospital. Hospital Director & Craniofacial Surgeon Dr. S.M. 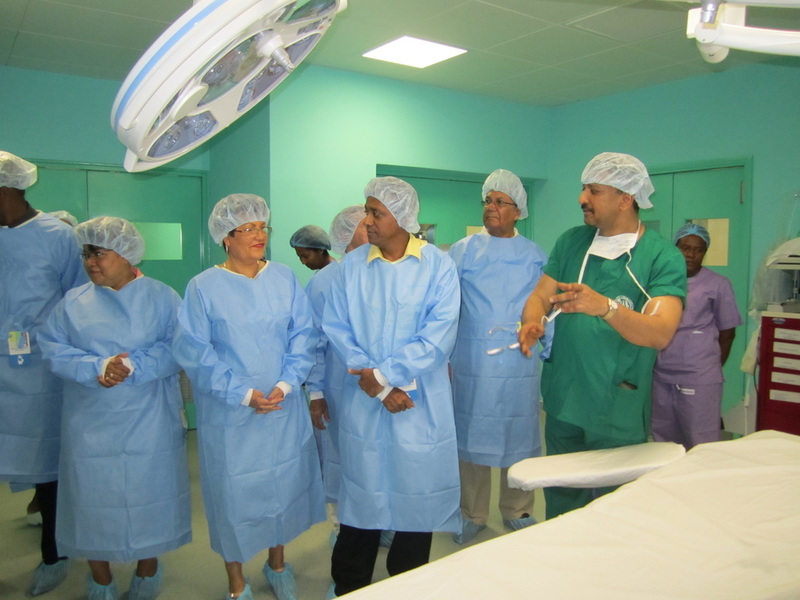 Balaji is the consultant Maxillofacial Surgeon at the Government Seychelles Hospital for almost 2 decades. His Excellency being presented the Transactions Book of the 7th World Cleft Lip & Palate Congress 2012 which was organized in Seychelles by Dr. S.M. 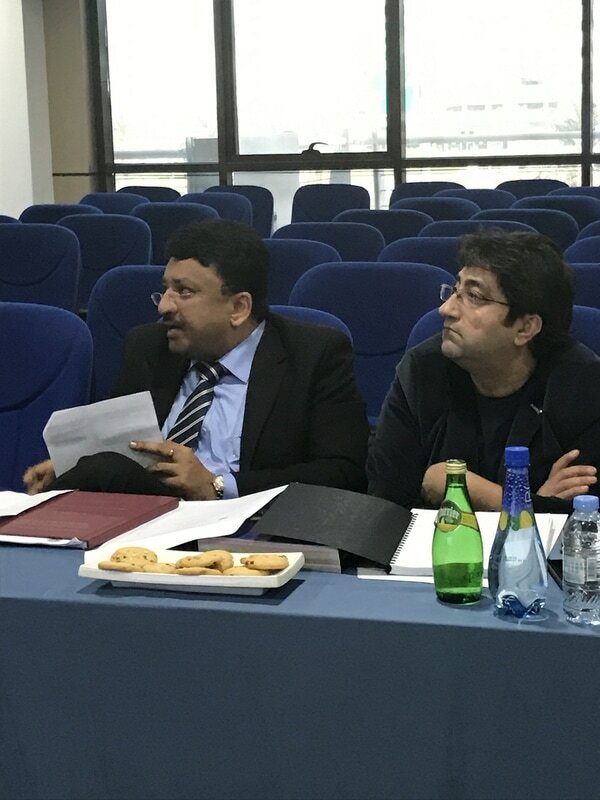 Balaji. It was the world conference of the International Cleft Lip and Palate Foundation, of which Dr. Kenneth Salyer is the President. Dr. S.M. Balaji is the consultant Maxillofacial Surgeon at the Government Seychelles Hospital, where he operates on children and adults with defects of the skull and face. He has been rendering his expertise on these voluntary missions for almost 2 decades. 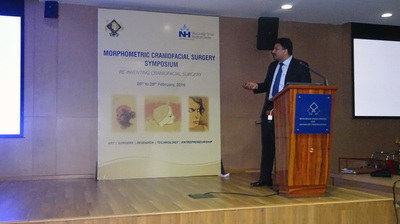 Craniofacial Surgeon Dr. S.M. 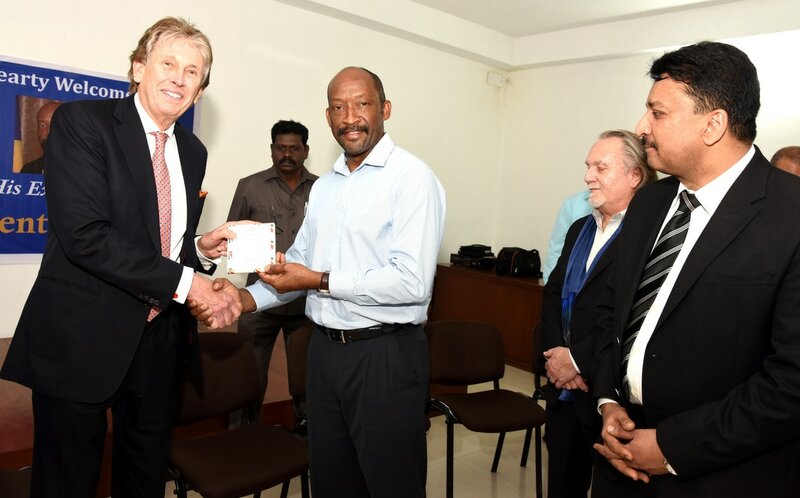 Balaji called upon newly elected President of Republic of Seychelles His Excellency Danny Faure, at State House, the office of the Hon'ble President, at Mahe, Seychelles. 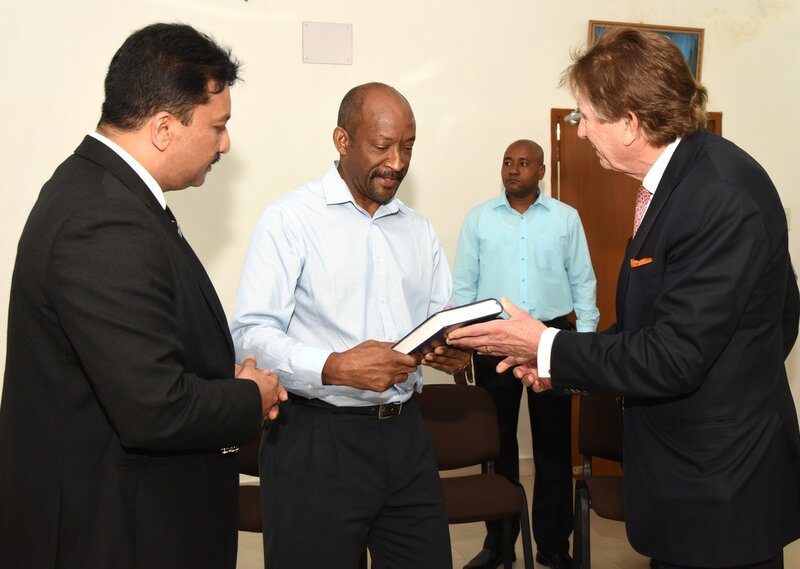 President Faure was sworn in to Office recently. 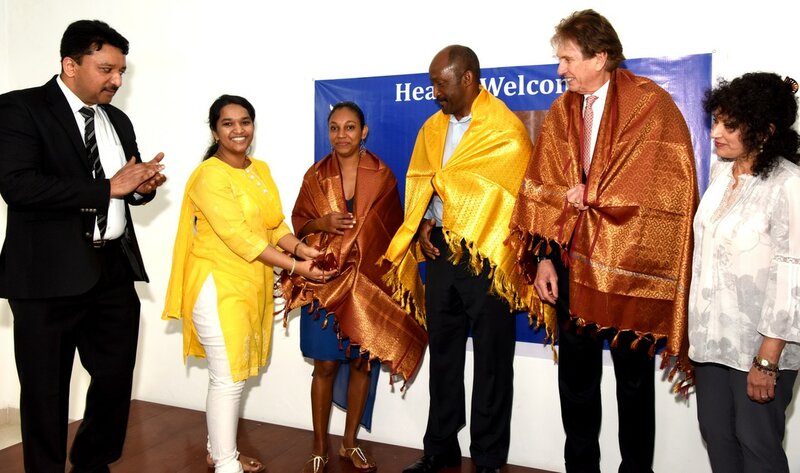 As a part of his Presidential Second generation of reforms he has ushered in wave of changes in Seychelles Healthcare System. He has set into action policies that focus on putting the people at the center of development. 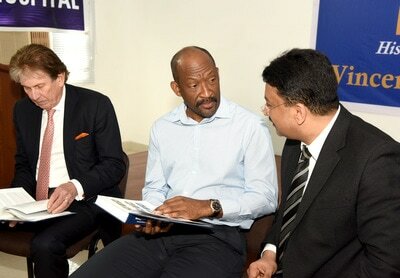 His policies will reform ministerial interference that often leads to chaos in health services. President Faure met Dr. Balaji who was visiting Seychelles. On invitation from the Seychelles Government, Dr. Balaji has been performing surgeries, as a part of his voluntary humanitarian services, for children and adults suffering from skull and face deformities, at the Seychelles Govt. 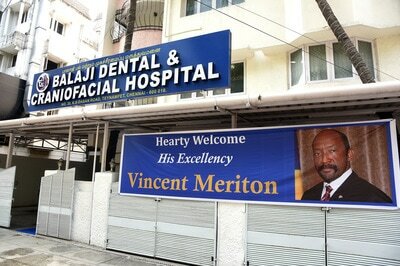 Hospital for almost 2 decades now. 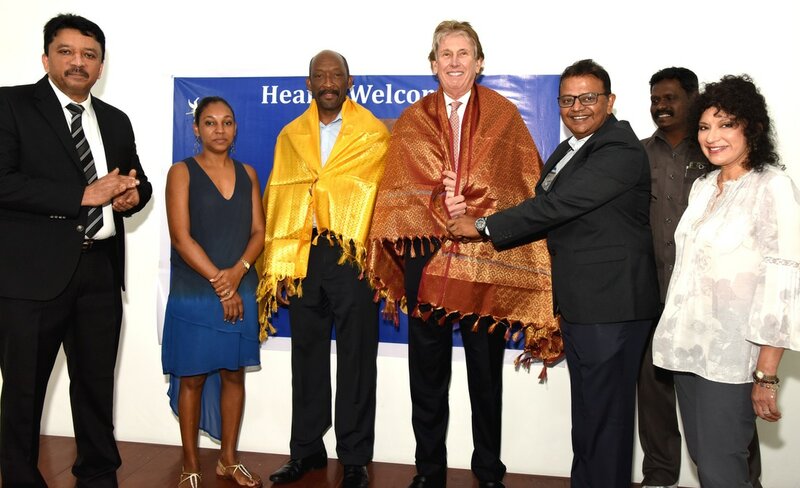 During the interaction President Faure thanked Dr. Balaji for his continued voluntary service to Seychellois as well as promised to improve the dental and maxillofacial healthcare facilities for better healthcare delivery. 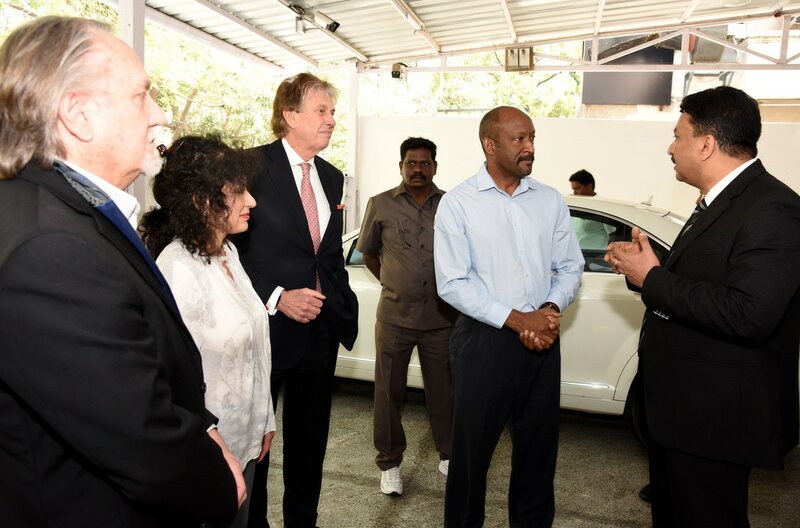 The President also recollected memories of his visit to Dr. Balaji’s hospital, Chennai, India, in 2014 when he was Vice-President. 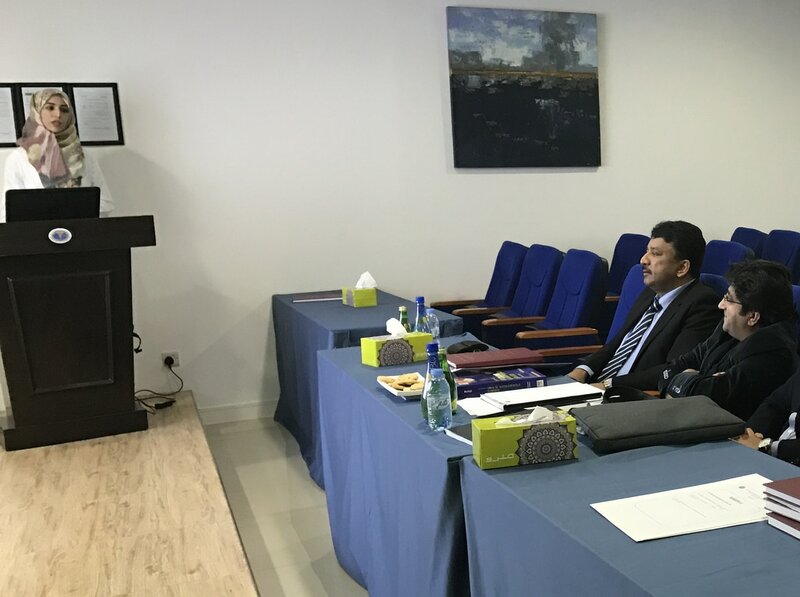 He had inaugurated the hospital’s Dental Implant Surgery Simulator ipad based application. 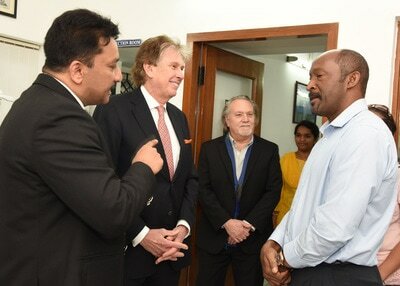 Congratulating the President, Dr. Balaji greatly appreciated the President’s dynamic policies, commitment and vision in improving the healthcare system in the island making the infrastructure and expertise one of the best in the world. 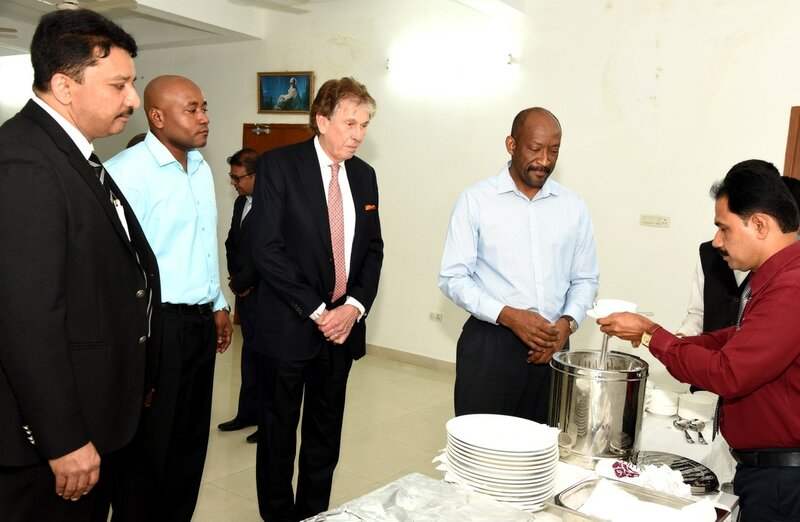 He expressed gratitude to the President for his visionary leadership and guidance that will bring development in all spheres including the Health Department. 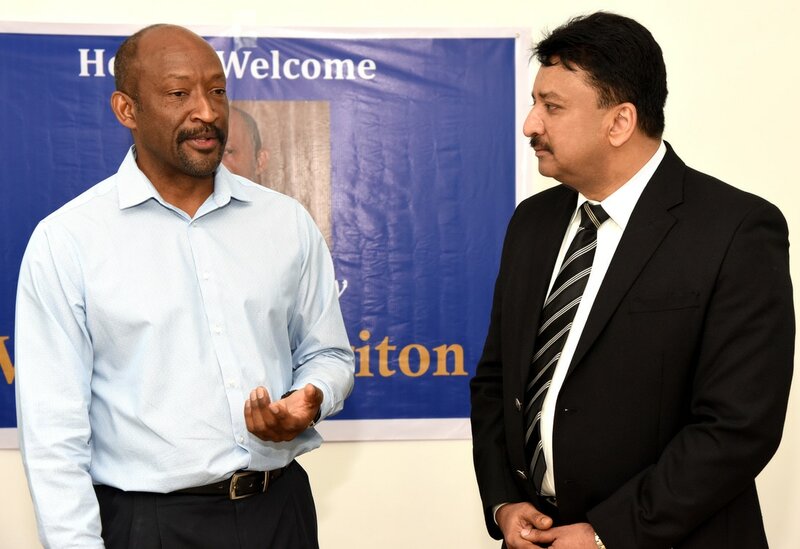 Earlier Dr. Balaji had called upon the newly appointed Seychelles Minister of Health and Social Services Hon’ble Jean Paul Adam. With the Hon’ble Minister at the head of the Ministry, observers believe that healthcare services will be better regulated making it world-class. Dr. S.M. Balaji met His Excellency Danny Faure, newly-elected President of Republic of Seychelles. 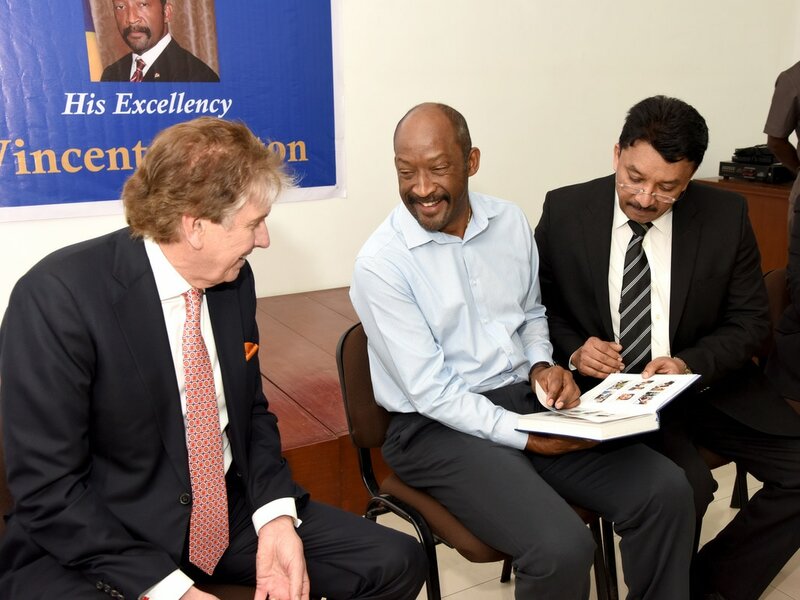 On invitation from the Seychelles Govt., Dr. Balaji has been performing cranio-maxillo-facial surgeries for those suffering from skull and face deformities, in Seychelles for almost 2 decades. Craniofacial Surgeon Dr. S.M. 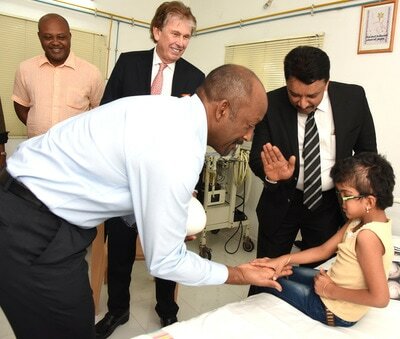 Balaji was invited by the Ministry of Health, Government of Seychelles, to operate on children and adults suffering from face and skull deformities, in the Government Seychelles Hospital at the capital city of Mahe. 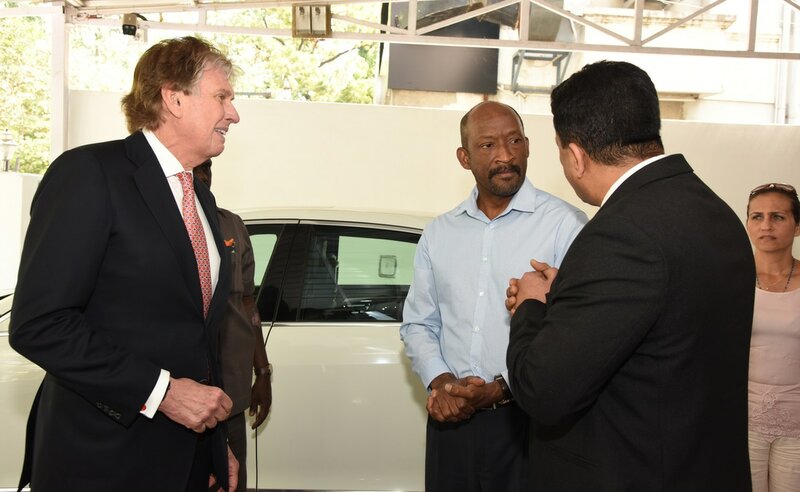 He called upon the newly appointed Cabinet Minister His Excellency Jean Paul Adam, Minister for Health and Social Affairs, Seychelles during his recent visit. Prof. Balaji being felicitated and welcomed as an international external examiner by Prof. Majed Hatem, Vice-Chancellor, MBHDUC. 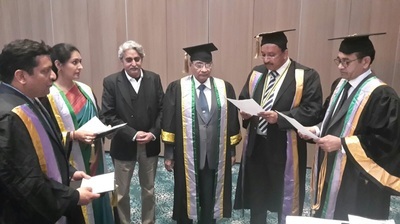 Prof. S.M. 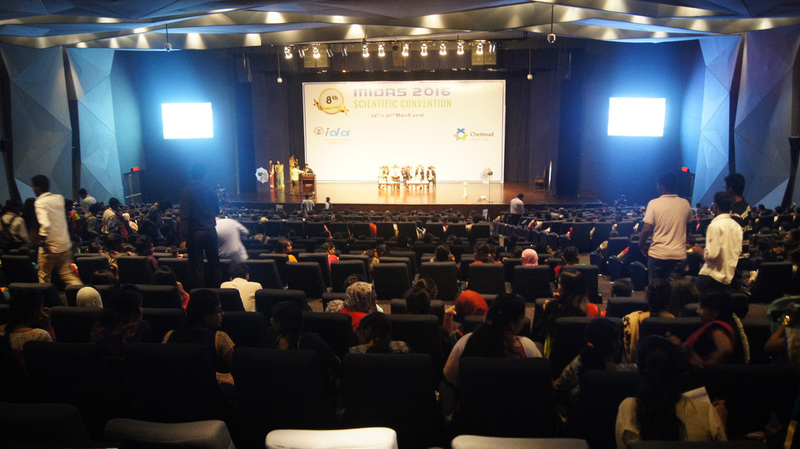 Balaji was invited to give the prestigious Dr. John Sebastian Oration on "Recent advances in Craniofacial Reconstruction" at the MIDAS 2016 Scientific Convention of Indian Dental Association (IDA) Madras State Branch, that was held at Sigapi Achi Convention Center, Chettinad Health City, Chennai, India. The Oration was Chaired by Prof. D. Kandaswamy, Dean, Sri Ramachandra Dental College, Porur, and Prof. K. Ravi, Dean. 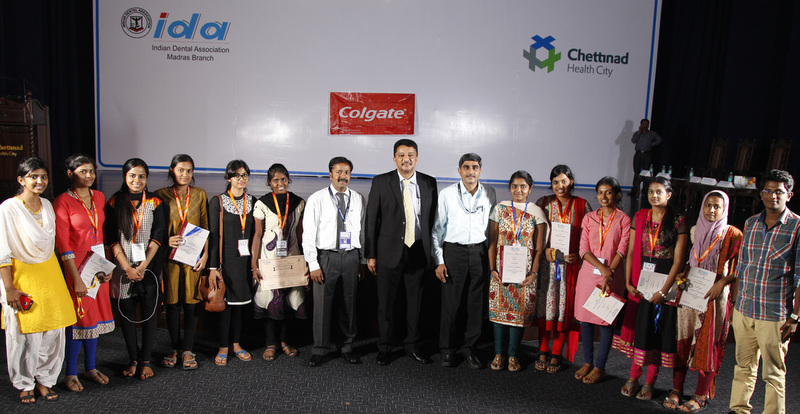 SRM Dental College, Ramapuram, Chennai, India. 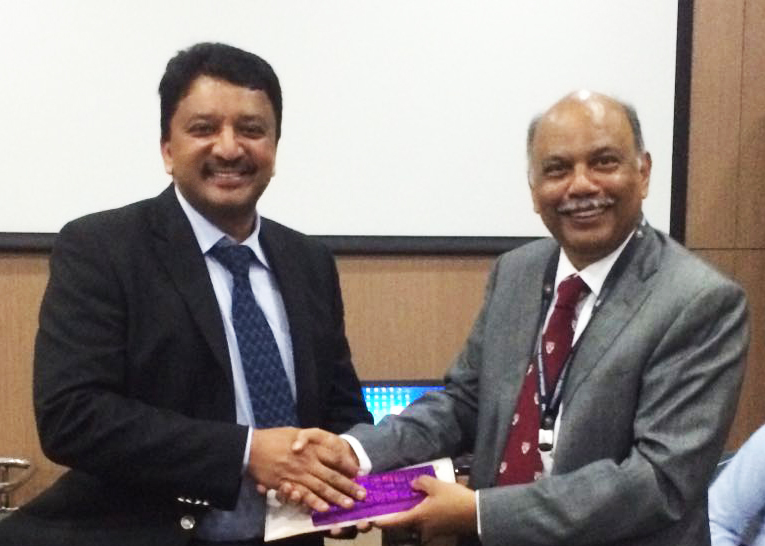 Prof. Kandaswamy thanking Prof. Balaji for his Oration and expertise. 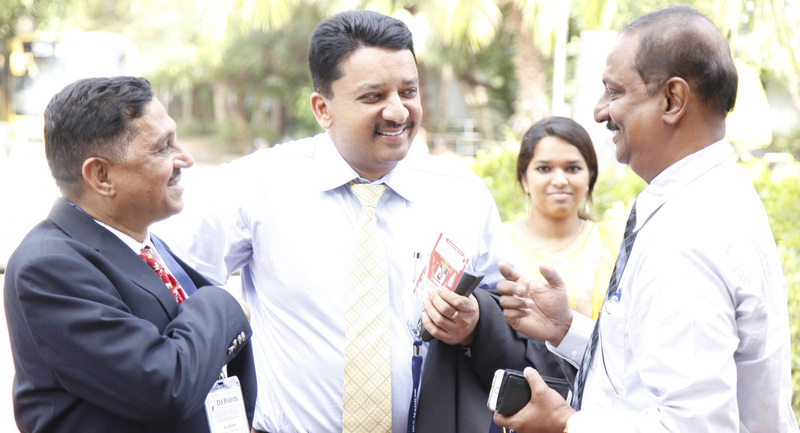 With the students - Prof. Balaji & Prof. V. Rangarajan, Former President Secretary, Indian Dental Association Madras State Branch, Secretary, Indian Prosthodontic Society. Seen here are Prof. Ashok Dhoble, Secretary General, IDA, Prof. S.M. 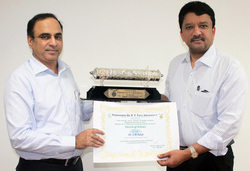 Balaji and Prof. B. Saravanan, Principal, Tamil Nadu Govt. 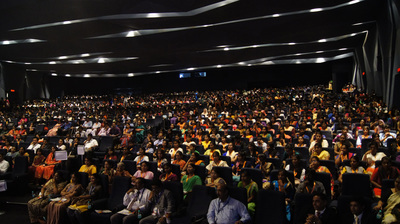 Dental College, Chennai, India. 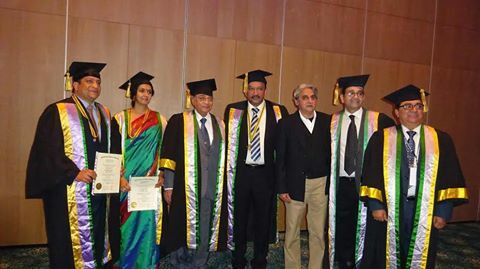 Dr. S.M. Balaji was Invited Speaker at the symposium on Morphometric Craniofacial Surgery organized by Dept. of Craniofacial Surgery, Mazumdar Shaw Medical Centre that was held at Narayana Health (formerly known as Narayana Hrudyalaya), Bengaluru. 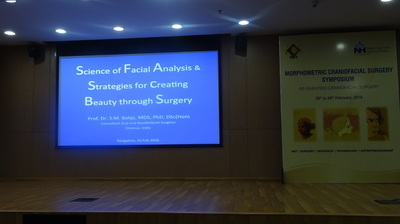 Dr. Balaji gave a lecture on "Science of facial analysis & strategies for creating beauty through surgery". 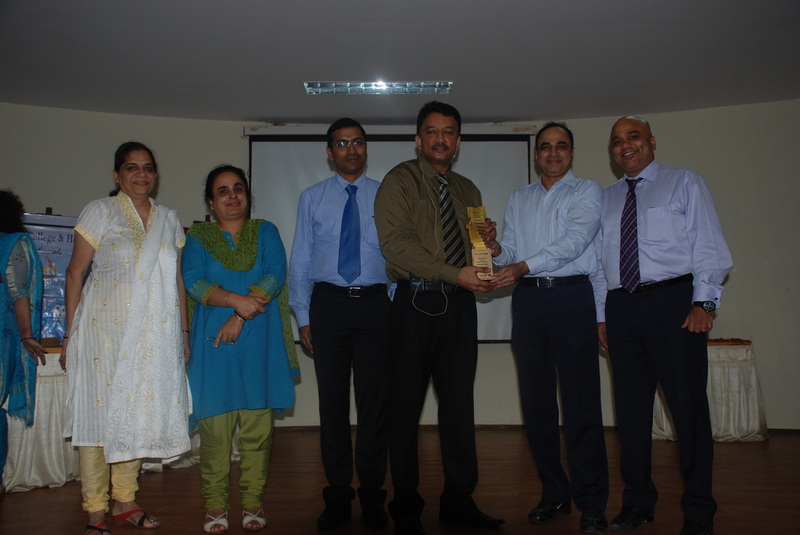 Following his lecture, he was honored by Dr. Paul Salins, Medical Director, Mazumdar Shaw Medical Centre. Dr. S.M. Balaji, President, International College of Dentists (ICD), India, Sri Lanka & Nepal Section, presided over the Convocation held at Leela Ambience Convention Hotel, New Delhi, during which Fellowships were conferred. 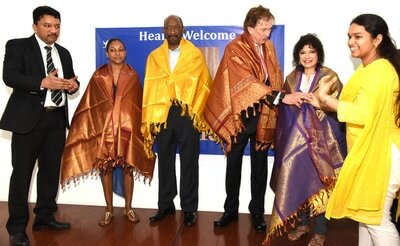 Seen here with the awardees are Former DCI President Dr. R.K. Bali, ICD President Dr. S.M. 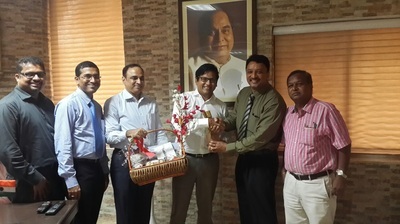 Balaji, President-Elect Dr. Rajesh Chandna, Secretary General/Registrar Dr. Rajiv Chugh, and Prof. Mahesh Verma, Director & Principal, Maulana Azad Institute of Dental Sciences. 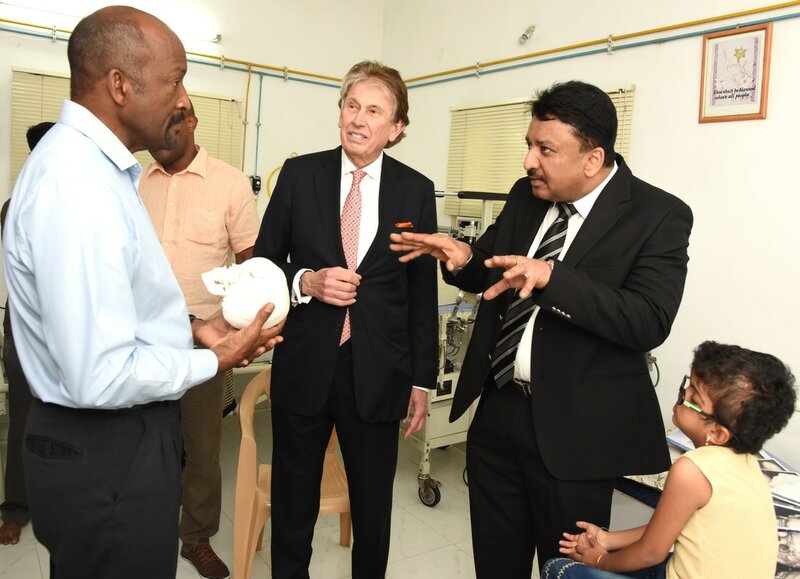 Recently, an 18-month-old Pakistani toddler from Karachi born with a congenital, bilateral Tessier’s facial Cleft Type 4 with orbital (eye) bone clefts was successfully rehabilitated at Balaji Dental and Craniofacial Hospital. Non-fusion of facial bones including the bones forming the eye sockets (orbit) results in facial clefts. 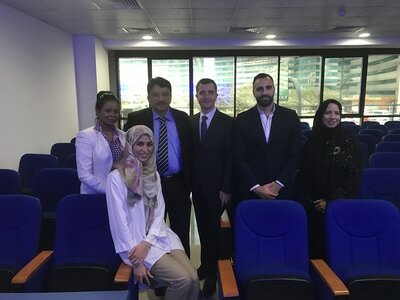 Of the nearly 20 major types of facial clefts, those involving orbit are often rare (more than 1 in 100,000 live births) and rehabilitations are complex. 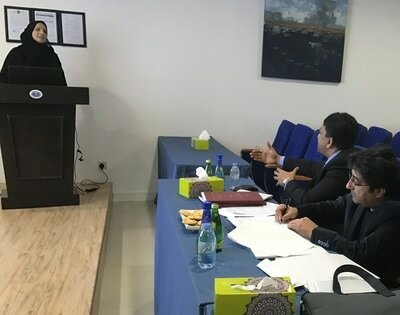 Children born with such severe deformities suffer immense difficulties in feeding, breathing, speaking and psychological trauma because of their appearance. Master Noman Arshad was born to Pakistani farmhands, Mr. Arshad Ali and Mrs. Raziya. Their 18 month old son, Master Noman was born with this bilateral Tessier’s facial Cleft Type 4 defect. Mr. Arshad Ali sought the best treatment for his son's defect. 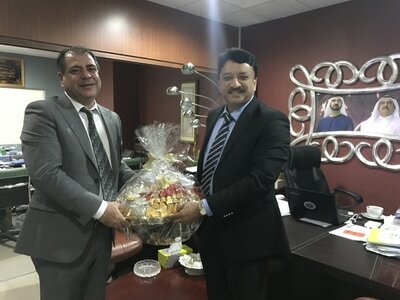 His search led him to renowned Dental Surgeon Dr. Asif Arian (drasifarain@hotmail.com) who is the President of Asia Pacific Dental Federation (APDF) & Former President of Pakistan Dental Association. 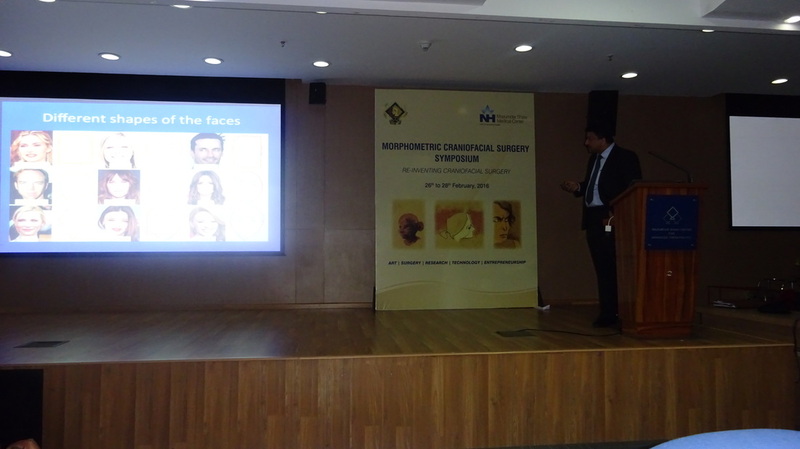 Being aware of Chennai based Craniofacial Surgeon Dr. S. M. Balaji’s work, Master. Noman was referred to Balaji Dental and Craniofacial Hospital. 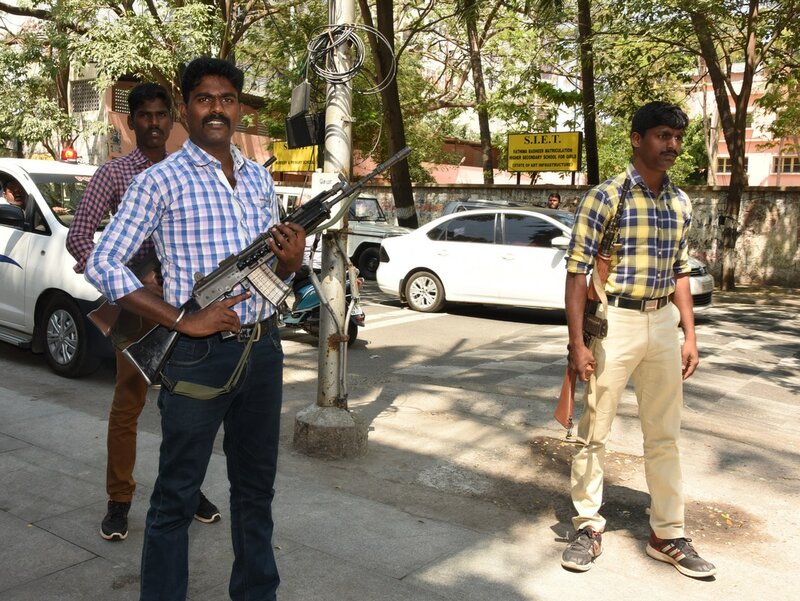 It was very tough to bring the Pakistani boy to India. 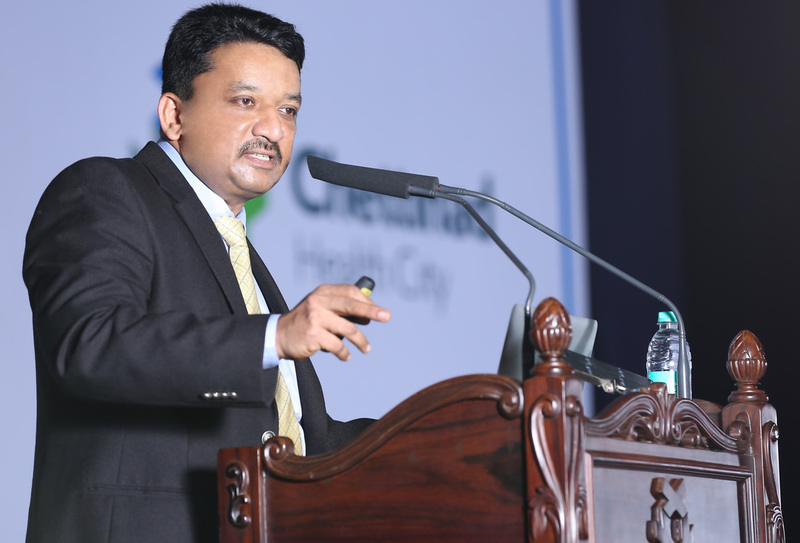 Dr. Balaji took rehabilitation as a challenge at several levels. The defect in itself was complex and it required skill and precision as the challenge was to salvage some vision for the boy. 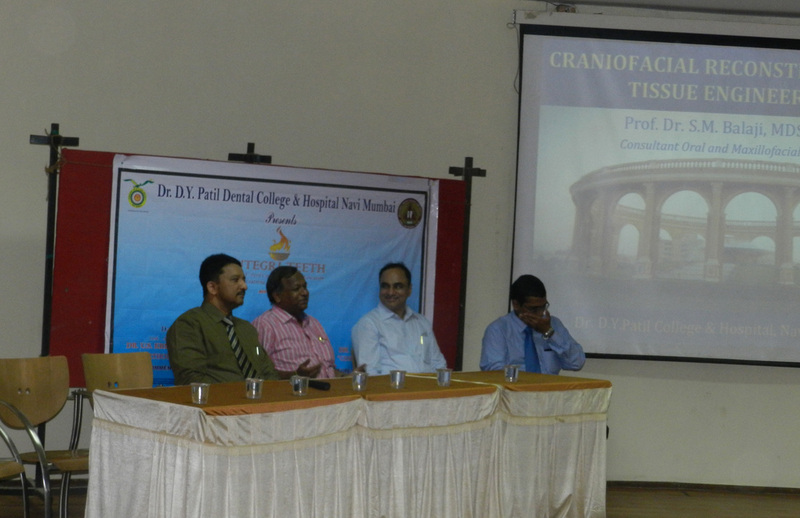 Dr. Balaji evaluated the extent of facial cleft with the help of 3D CT scan. 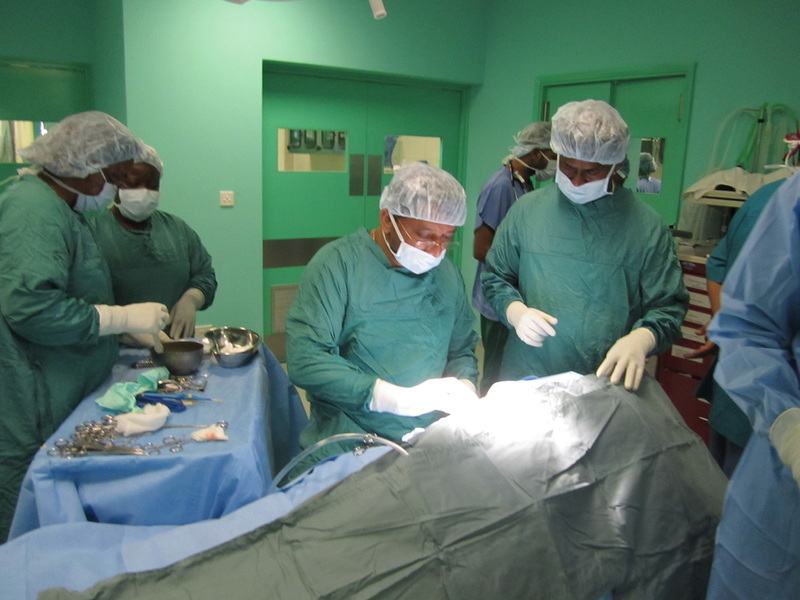 The boy had bilateral cleft lip & palate which was extending to the orbital (eye) floor resulting in a deformed eye and eyelids. The left eye was congenitally absent. There was no vision in the left eye and also the right eye had only 40% vision. 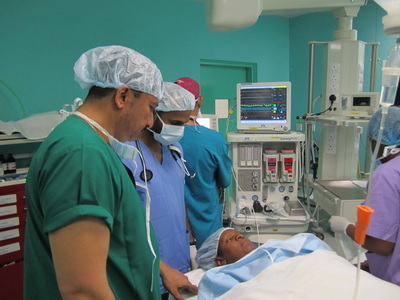 Due to the extensive involvement of the eyes in the cleft defect, the nasolacrimal ducts were damaged causing epiphora or continuous tear flow from the eyes. Because of the cleft, the child could not be normally fed nor was there a chance of good speech formation. The central part of cleft was attached to the upper lip. 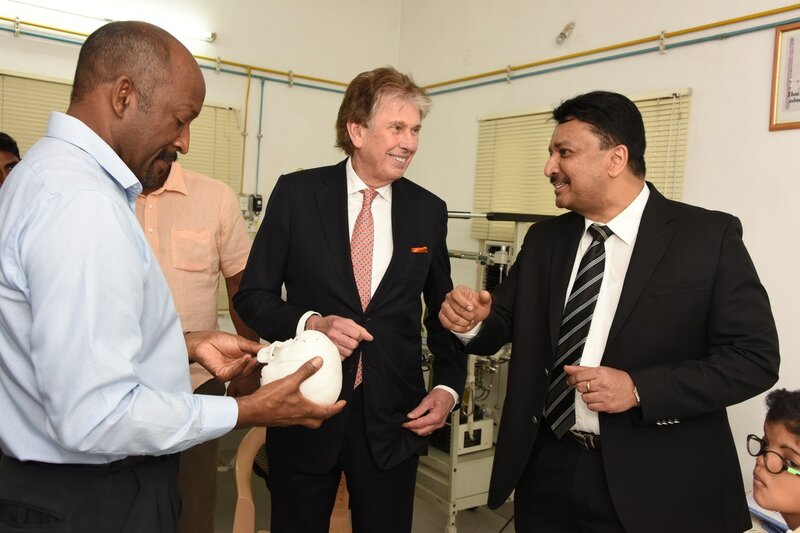 Dr. Balaji’s plan was to immediately close the lip defect to recreate the mouth to enable the baby to be fed well and to have a reasonable facial profile. 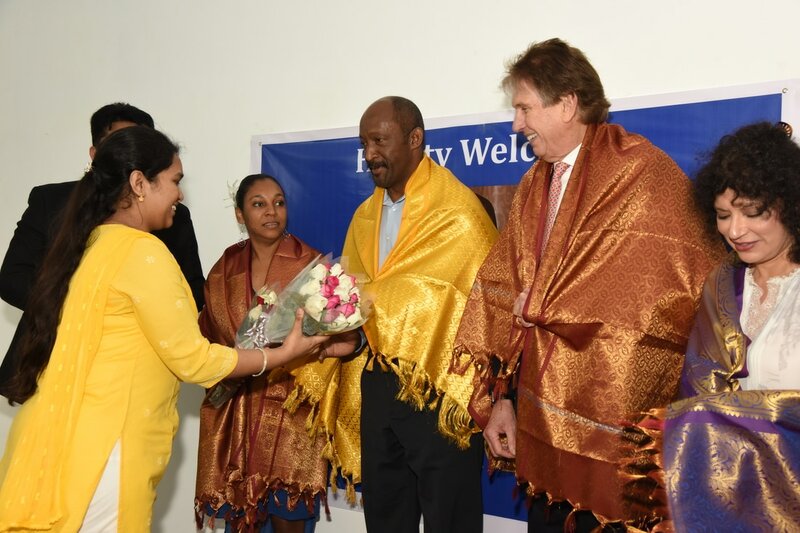 In addition, Dr. Balaji’s foremost concern was to save the baby’s vision in the right eye, prosthetically replace the congenitally missing left eye to improve the appearance for social acceptance and to correct the abnormal tear flow. 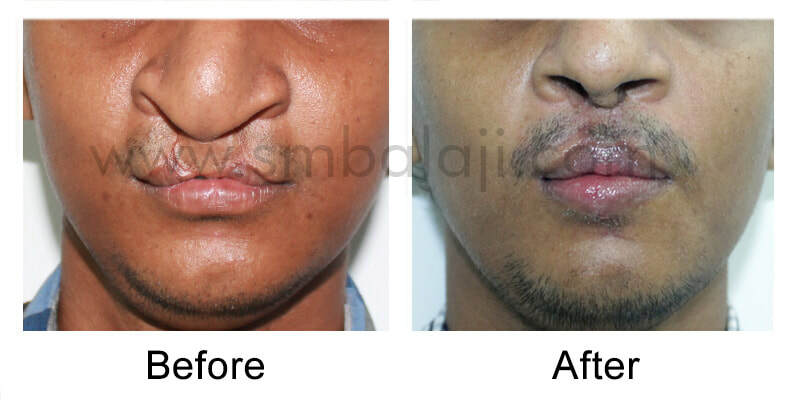 Hence in a 6 hour long surgery, Dr. Balaji closed the bilateral cleft lip. He then recreated the upper eyelids. All extra tissue tags were carefully dissected out. The internal architecture of the eye socket was recreated. 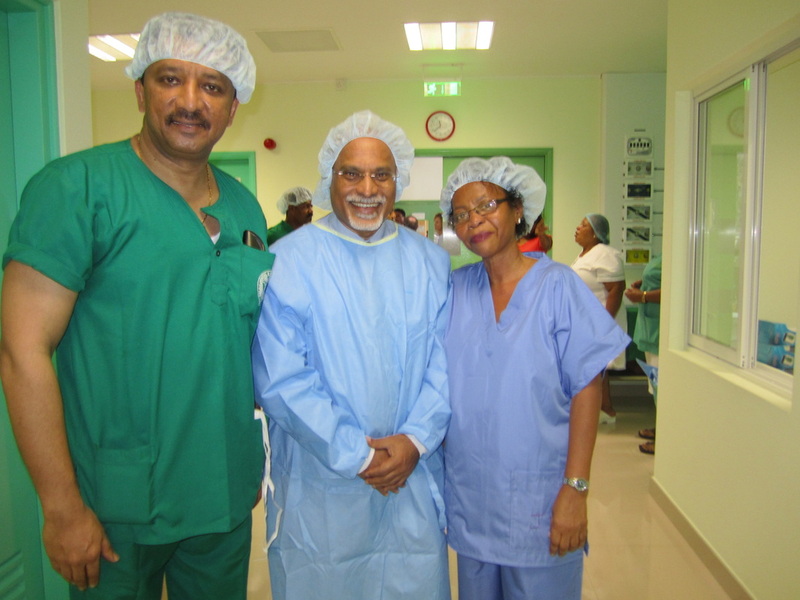 In the process, careful surgical handling ensured salvaging of the vision of the right eye. A prosthetic eyeball was fixed in the left eye to closely resemble a normal eye. The abnormal tear flow was corrected with DCR or Dacryocystorhinostomy in which a new direct communication was created by placing a silicone tube to enable the tears to drain into the nose. With the completion of first step of reconstruction itself, Master Noman now has a more normal appearance and his feeding has improved greatly. 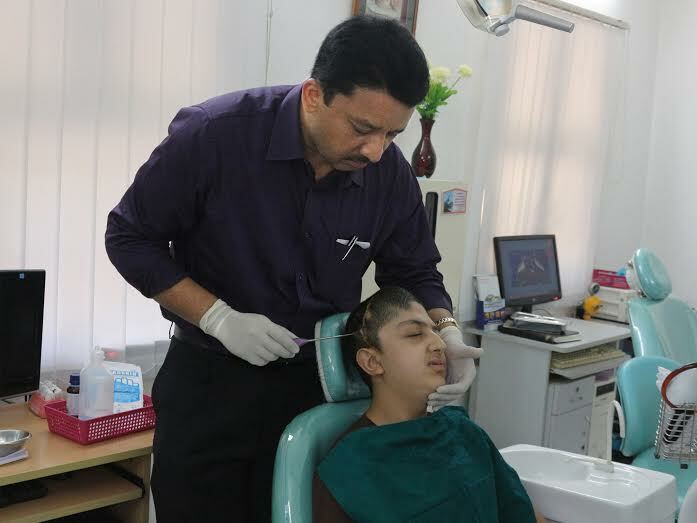 The parents are now psychologically strengthened with their baby’s improved facial appearance & health and they are returning to Karachi. 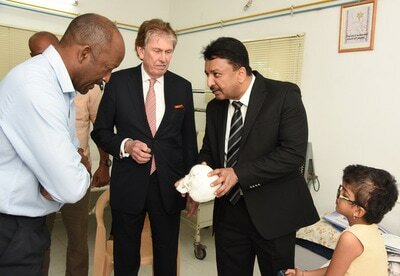 This being a unique case of a Pakistani baby successfully receiving facial reconstruction surgery in Chennai, a press meet has been organized. The awareness of availability of corrective methods for such rare facial deformities in Chennai needs to be created. New Operation Theatre at the Government Hospital at Mahe, Ministry of Health, Republic of Seychelles was inaugurated by His Excellency Hon’ble Mr. Danny Faure, Vice President of Seychelles. 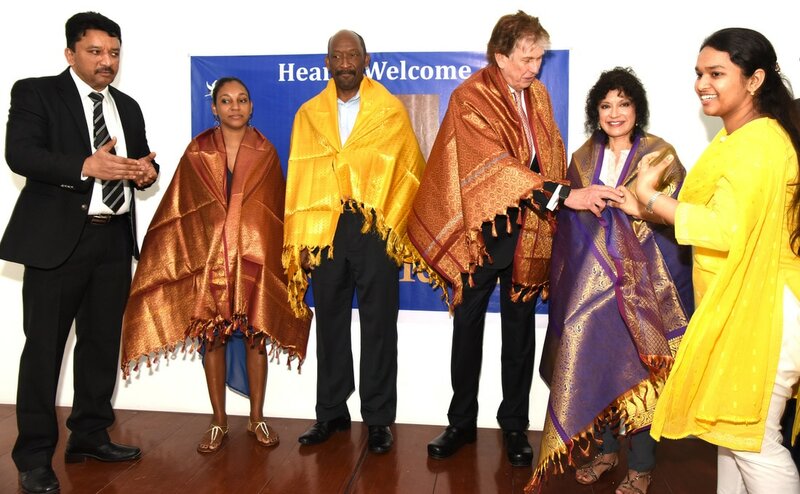 Other dignitaries present at the handing-over ceremony were Health Minister of Seychelles Hon'ble Mrs. Mitcy Larue, Former Health Minister Dr Erna H. Athanasius MD Pediatrics, Chief Justice of Seychelles Supreme Court along with Nurse Manager of Operation Theatre Mrs. Ramona Bristol. 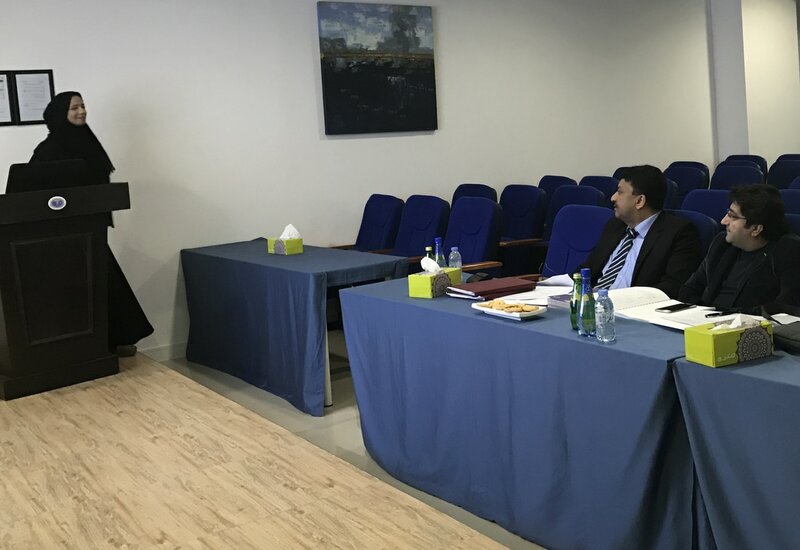 Prof. S.M. 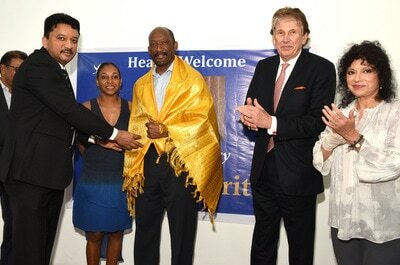 Balaji, Maxillofacial Surgeon operated on the inaugural day. "'INTEGRI-TEETH" the Annual Continuing Dental Education Learning Series & Workshops of the Renowned Dr. DY Patil Dental College and Hospital, Navi Mumbai. Prof. Dr. S. M. Balaji was invited as the chief guest and speaker for the "'INTEGRI-TEETH" the Annual Continuing Dental Education Learning Series & Workshops of the Renowned Dr. DY Patil Dental College and Hospital, Navi Mumbai. 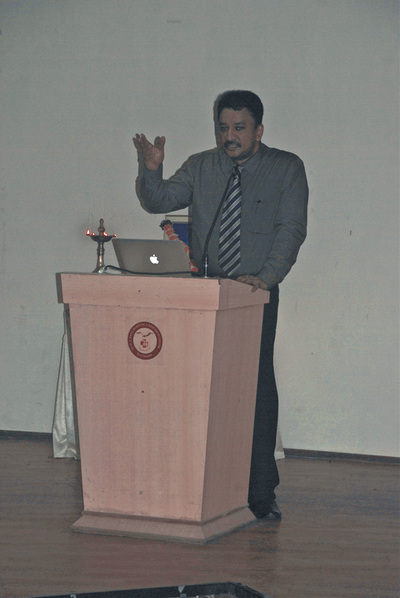 Dr. S. M. Balaji spoke extensively on the Tissue Engineering and Craniofacial Surgery as well as on the Embryology of Craniofacial Defects among the undergraduate and post graduate students of the University. His speech was well received. Actor Mr. Napoleon congratulating the boys successfully treated craniofacial defortmity. 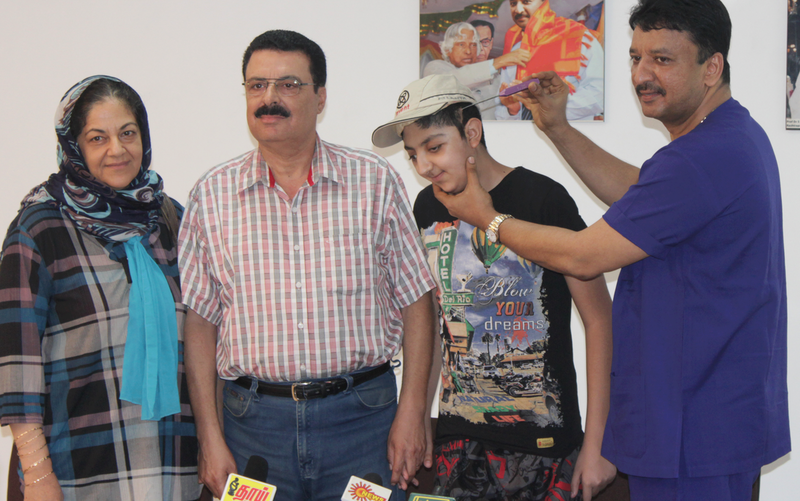 A complex facial deformity in an Iraqi boy born with Crouzon syndrome, was successfully treated at our hospital. Fourteen-year-old Master Mustafa Awad was born with a rare facial bone deformity called Crouzon syndrome. 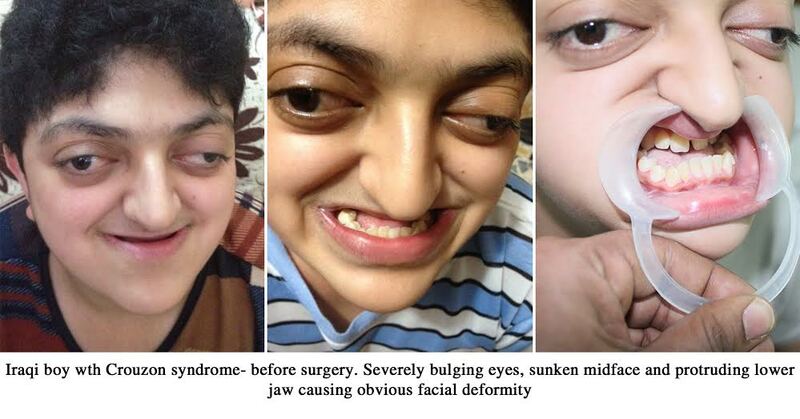 This is a rare, autosomal dominant, genetically inherited condition in which there is premature fusion of the facial bones causing abnormal development of the skull and an obvious facial deformity. In addition, the growth and function of vital structures such as eye, ear, nose could be affected. Mustafa’s parents, both General Physicians prac­ticing in Iraq, were very worried about their son’s condition. Mustafa had an abnormally shaped skull & face. His eye sockets were shallow causing the eyes to become very bulging. He had a small upper jaw, sunken midface and protruding lower jaw. 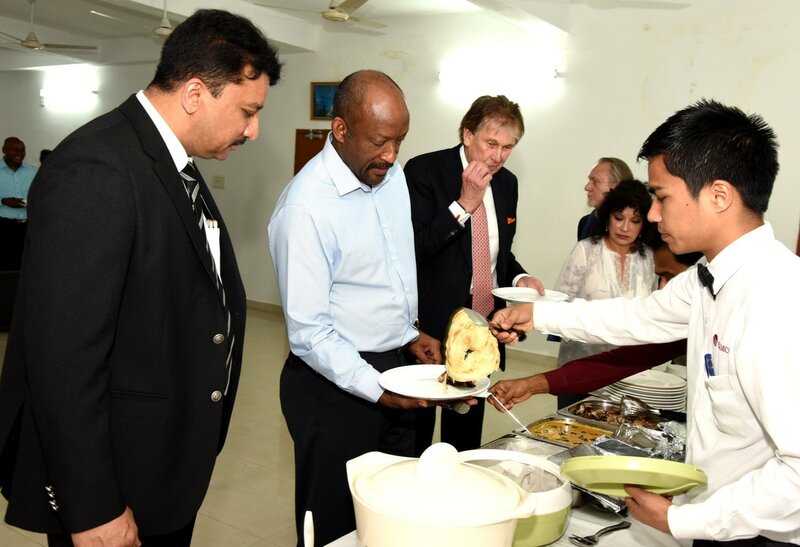 Also he had difficulty in chewing, swallowing, speaking & breathing difficulties during sleep. Due to his “different” appearance, children at his school used to stare at him a lot, making him very self-conscious and depressed. Dr. Salam Awad, Mustafa’s father, approached many doctors worldwide but was not satisfied with their treatment plans. Mustafa and his parents came to our hospital and having consulted Dr. S.M. 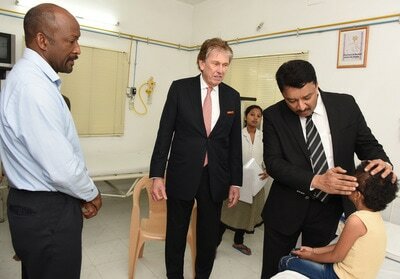 Balaji, they were convinced that ours was the best centre to get the boy treated. 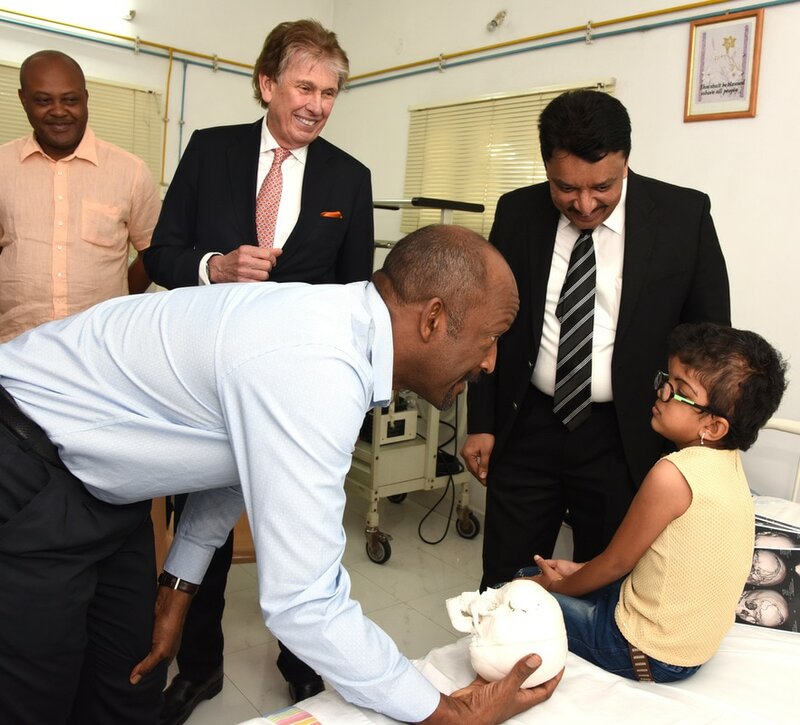 Dr. Balaji assessed the boy's deformity using advanced 3DCT scan and decided to perform the latest Internal Distraction Osteogenesis to advance the face bones. Distraction Osteogenesis is a relatively new technique, where bone is expanded in a slow, controlled manner. Earlier huge box-type external rigid frames were used. For the first time, the latest internal distractors were employed. 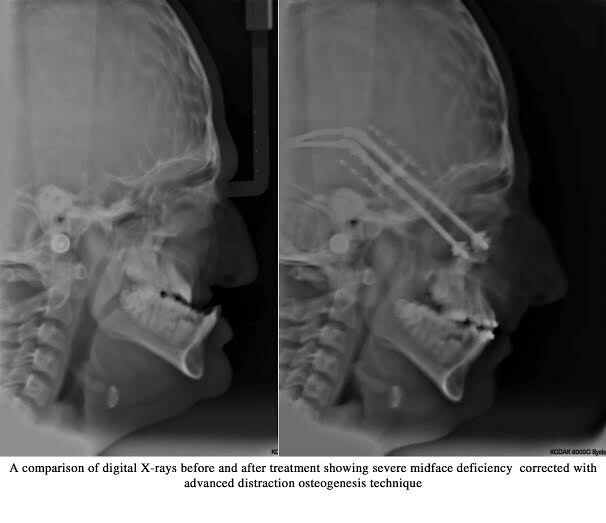 Using the recent type of multivector Distraction Osteogenesis called Kawamato Distractors, facial bones were expand­ed in 3 dimensions gradually over a month. The growth of the face bones was internally weak so rhBMP-2 protein was added to promote new bone growth. With gradual expansion of the bone everyday, the symptoms were reversed. Mustafa’s upper jaw was slowly brought forward thus increasing the volume of eye socket and reducing the bulging of the eyes. This dramatically improved his appearance giving him “a new face”. Breathing, chewing, speaking functions became easier. Mustafa is very happy with his improved look & that people will not stare at him anymore. 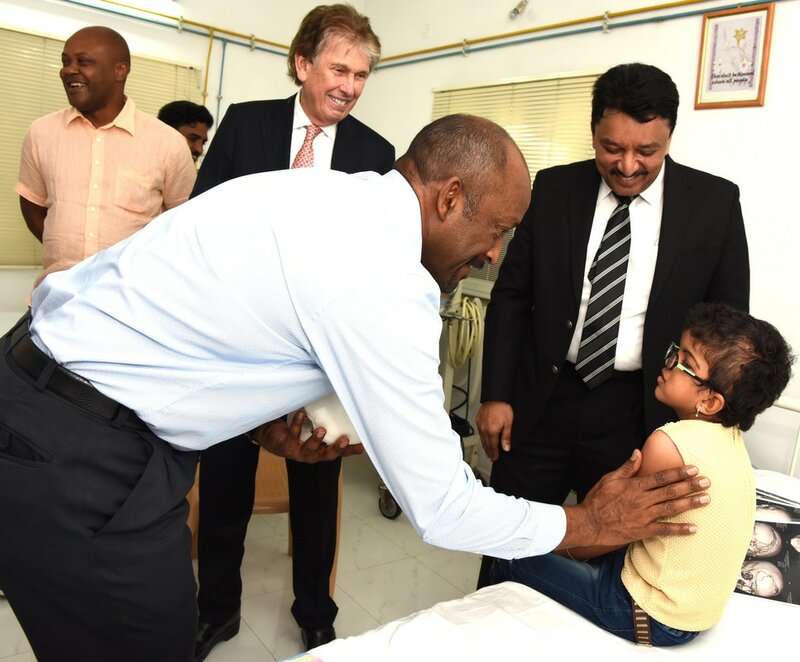 The boy and his family were very pleased that the surgery has good results and they heartily thanked Dr. Balaji for his expertise. 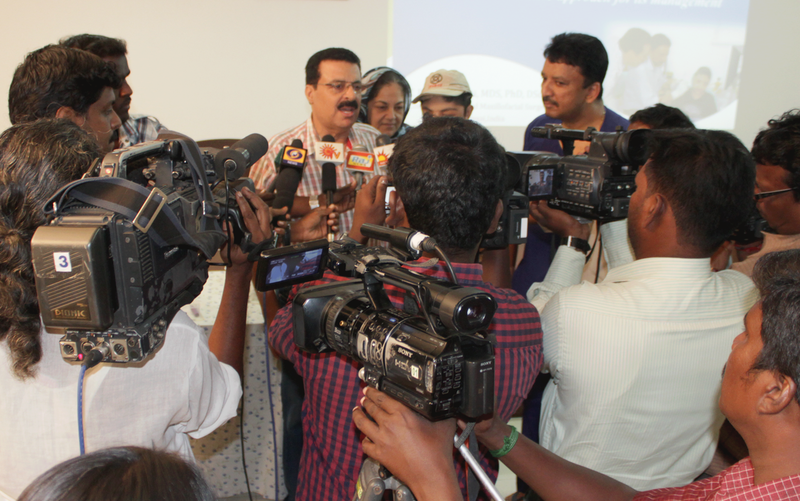 The news about Dr. S.M. Balaji's achievement was given wide coverage by all sections of the media. 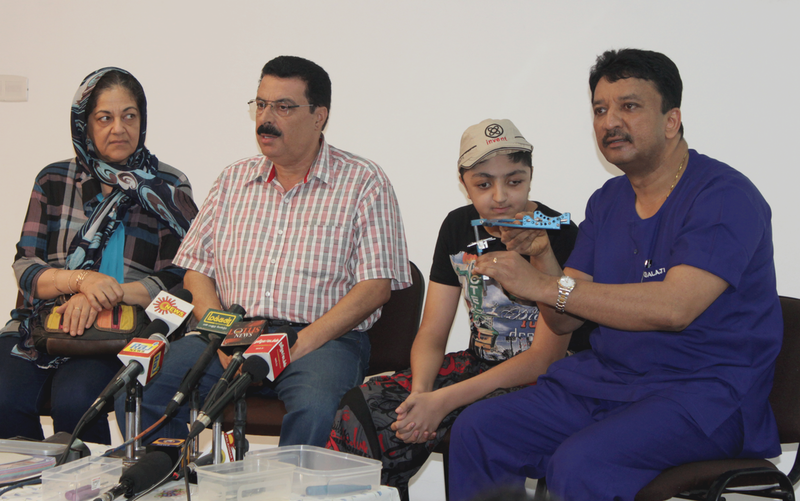 The parents also gave an interview to share about their son’s condition and successful surgery. This increases awareness about such complex illnesses and their treatment options. 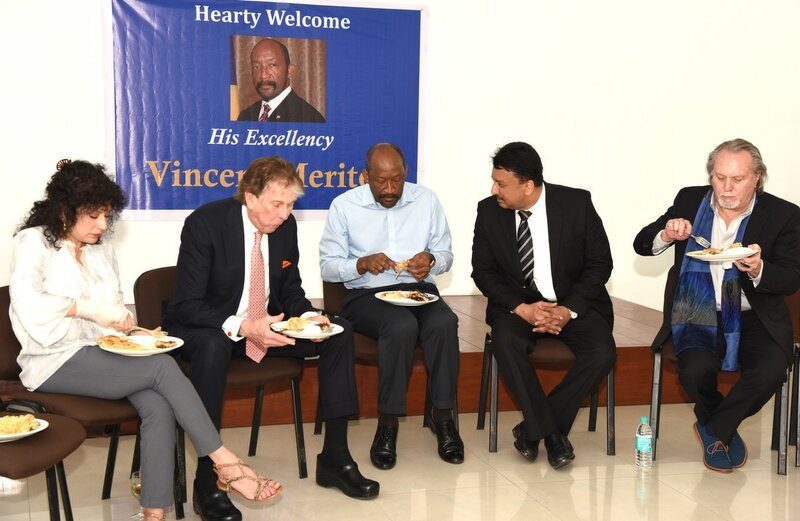 The world’s highest body in dental research is the International Association of Dental Research (IADR) with head quarters in USA. 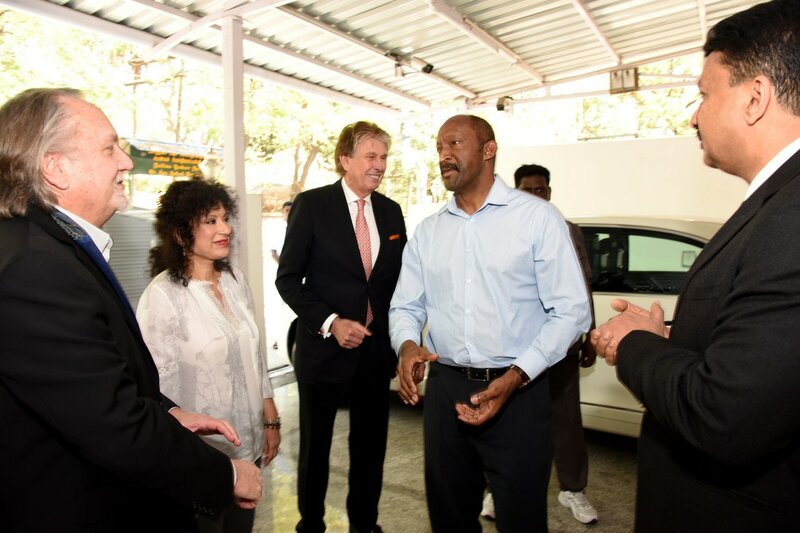 The association has about 12,000 members worldwide. 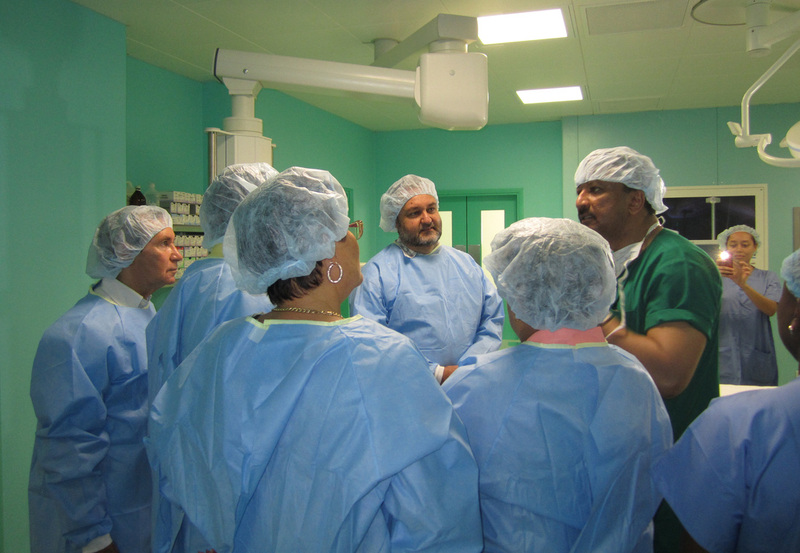 The 92nd Annual Congress of this scientific body was held during June 25th – 28th 2014 at Cape Town, South Africa. To increase the quality of dental research and research manuscript across the globe, the IADR had organized a symposium to deliberate and identify possible solutions. In this symposium, Prof. S. M. Balaji, as Editor-in-Chief, Annals of Maxillofacial Surgery & Executive Editor, Indian Journal of Dental Research was invited to represent the Asian region in this one of its kind scholarly program. 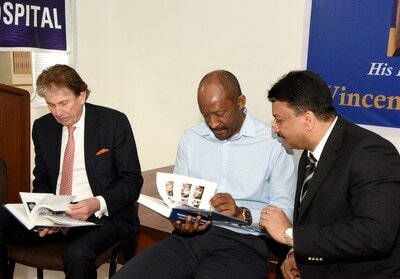 The Symposium was chaired by Prof. Kenneth A. Eaton, United Kingdom, Chairman of the British Dental Editor’s Forum. The other prominent faculty was Prof. William Giannobile, USA, Editor-in-Chief, Journal of Dental Research. 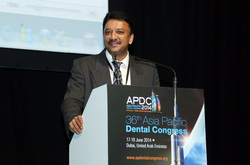 The congress is one of the largest dental meetings in the world. 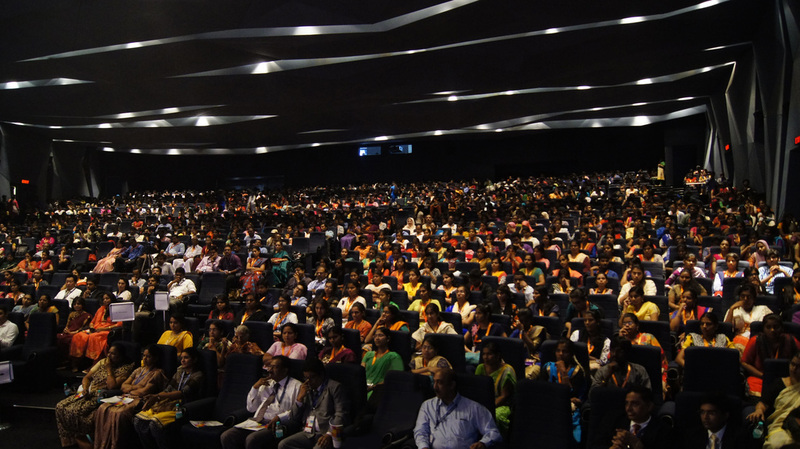 It has the largest footfall and sees a plethora of scientific findings, innovations. 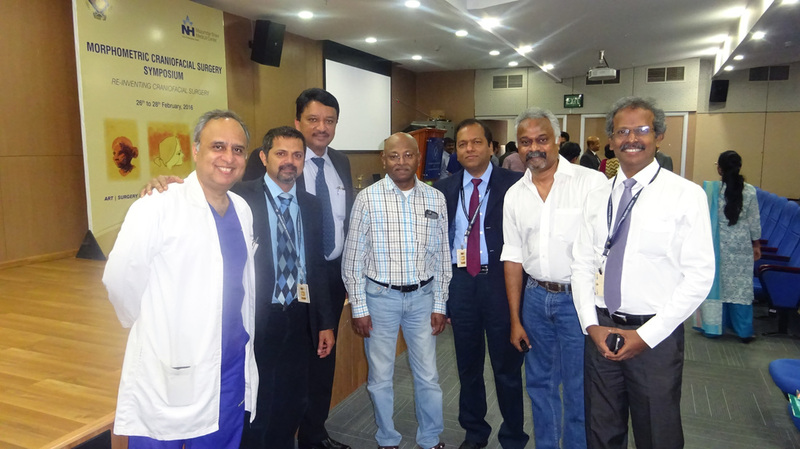 Dr. Balaji was one of the very few selected surgeons selected to speak in this congress. 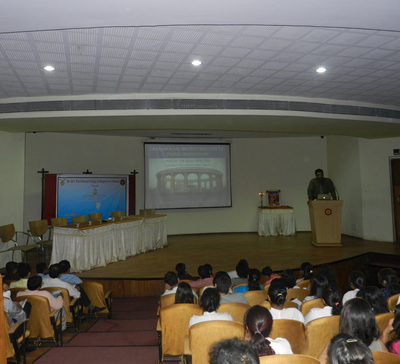 He lectured extensively on the ways to regenerate the jaw bone after loss of the teeth. It is a common situation that residual jaw bone height diminishes after removal or extraction of teeth. 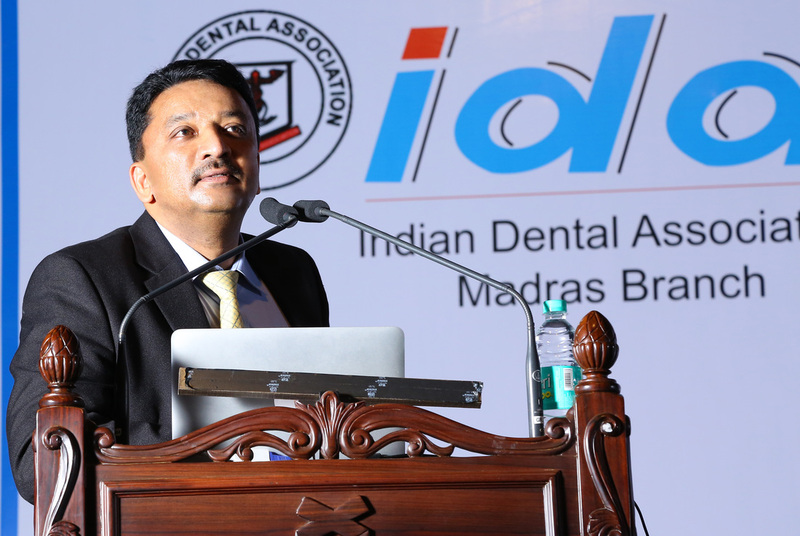 Dr. Balaji spoke on length about the non-surgical ways through which the bone height could be drastically increased to place dental implants, citing his rich experience in the field. 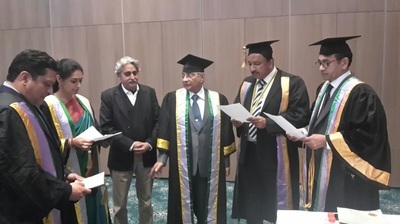 Dr. S. M. Balaji was conferred with Doctor of Science (Honoris Causa) by the Padmashree Dr. DY Patil University, Mumbai, as a mark of appreciation of his contributions to dentistry and craniofacial deformed children. The Registrar of the University, Dr. Uday Shende, presented the degree to Dr. S. M. Balaji as he was not able to receive the degree in person. His Excellency Mr. Danny Faure, Vice President of Seychelles inaugurating the Dental Implant Surgery Simulator ipad based application at Balaji Dental and Craniofacial Hospital. Also seen are HE Mr. Waven William, High Commissioner of Seychelles at India, Mr. Sai, Hon. Consul General of Seychelles at Chennai, and Dr. S.M.Balaji. Dr. S. M. Balaji explains the innovative "Tissue Expander" Craniofacial Surgery in a patient to His Excellency Mr. Dany Faure, Vice President of Seychelles. Seen along is HE Mr. Waven William, High Commissioner of Seychelles at India and Mr. Sai, Hon. Consul General of Seychelles at Chennai. 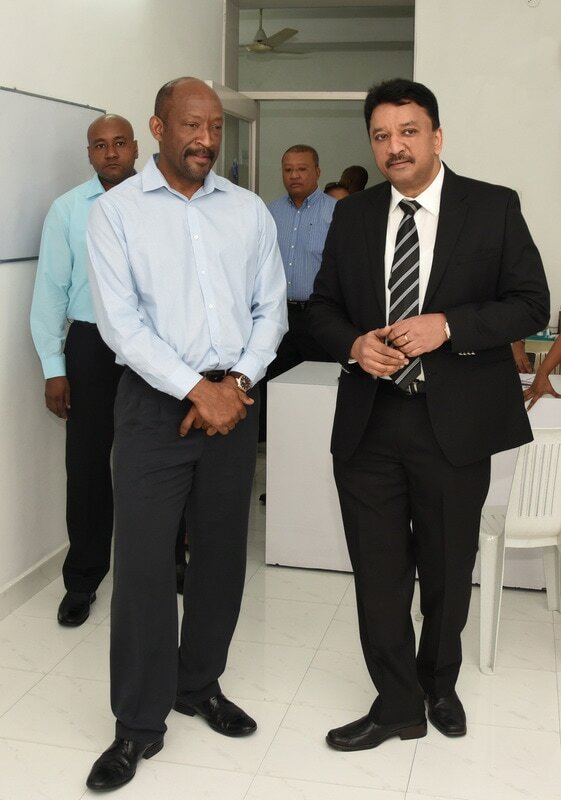 His Excellency Mr. Rollen Danny Antonie Faure, Vice President of the Republic of Seychelles during an official visit to promote Indo-Seychelles relationship, visited Balaji Dental & Craniofacial Hospital. 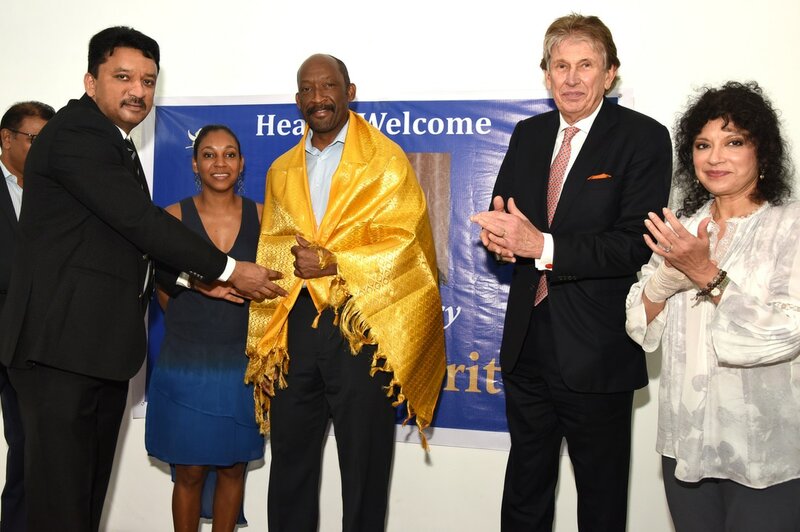 He lauded the meritorious services rendered by Dr. S. M. Balaji to the Seychellois and the healthcare system of Seychelles. Dr. S. M. Balaji has been rendering free surgical care to the African Island nation of Seychelles by perform­ing complex reconstructive surgeries for those afflicted with craniofacial deformities. 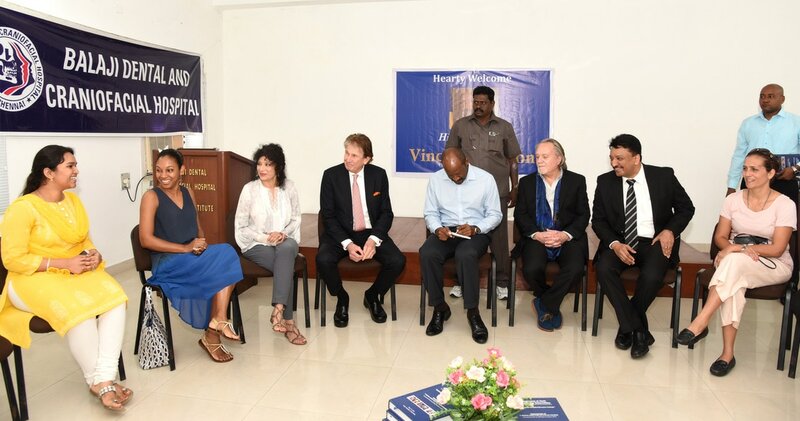 Commending his expertise, His Excellency said that Dr. Balaji’s impeccable surgical acumen and diligent care has made the Hospital a preferred centre for the care of those affected with skull & face deformities, from all over the world. 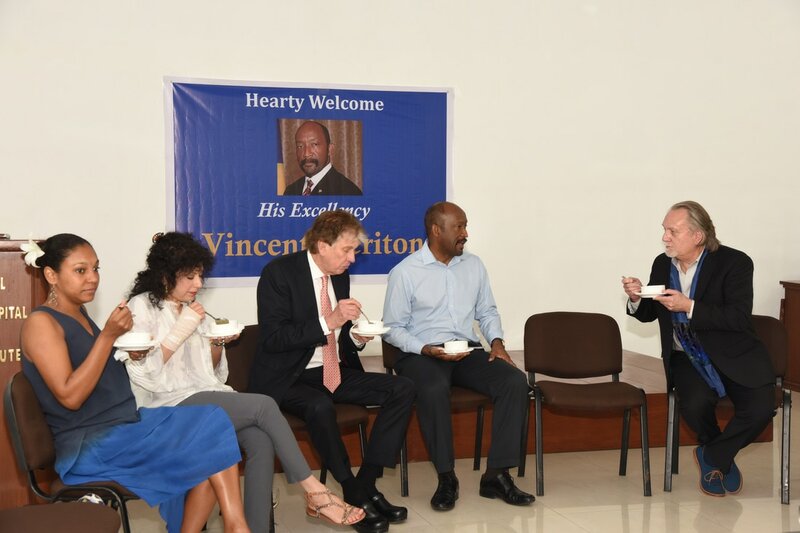 His Excellency conveyed the respect and affection the people of Seychelles have for Dr. Balaji and also thanked him for mentoring maxillofacial surgeons in complex craniofacial surgery to provide better care at Seychelles. 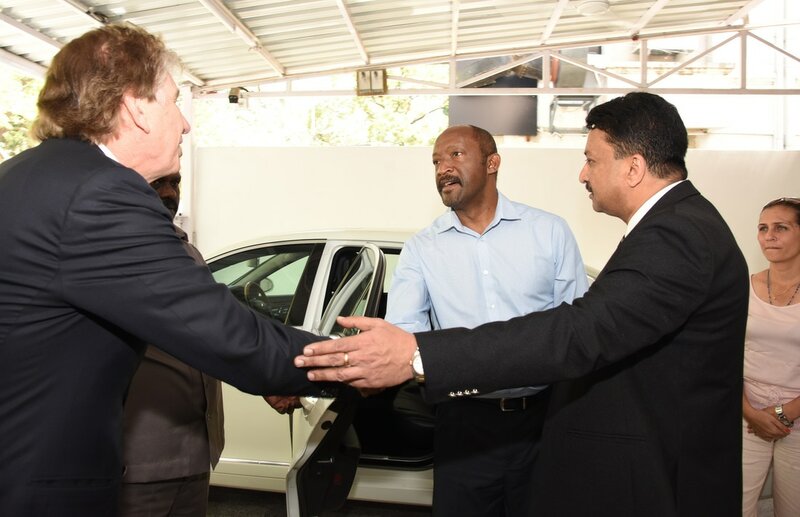 His Excellency the Vice President, accompanied by HE Mr. Waven William, High Commissioner of Seychelles at India and Mr. M. Sesha Sai Mechineni, Hon. 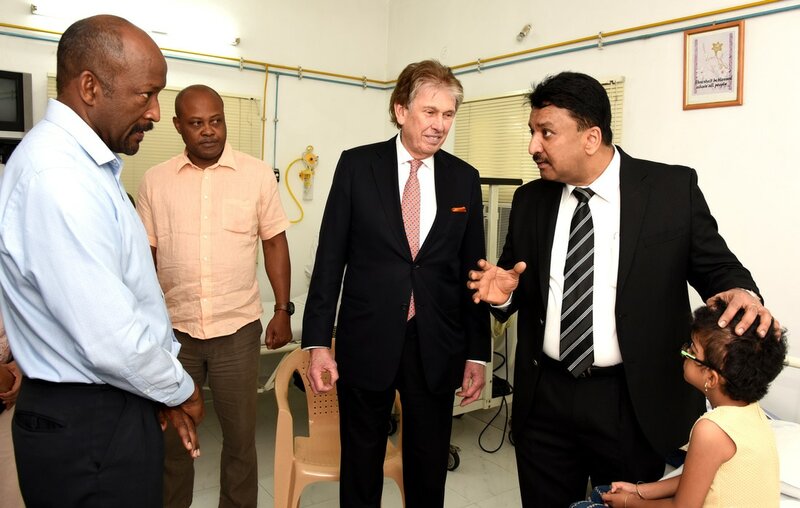 Consul General of Seychelles at Chennai, inaugurated the apple i-pad based dental implant surgery stimulatory application at the hospital. 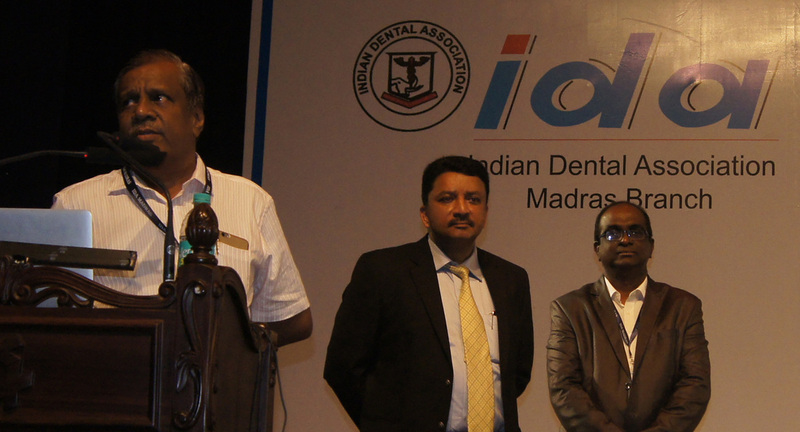 Nov 10, 2013: BITEIN is an all encompassing web portal disseminating the latest in dentistry and work & achievements of Indian dentists. Every year, eminent surgeons, academicians, researchers and dental practitioners are presented with prestigious BITEIN Dental Awards in their respective fields of specialty. 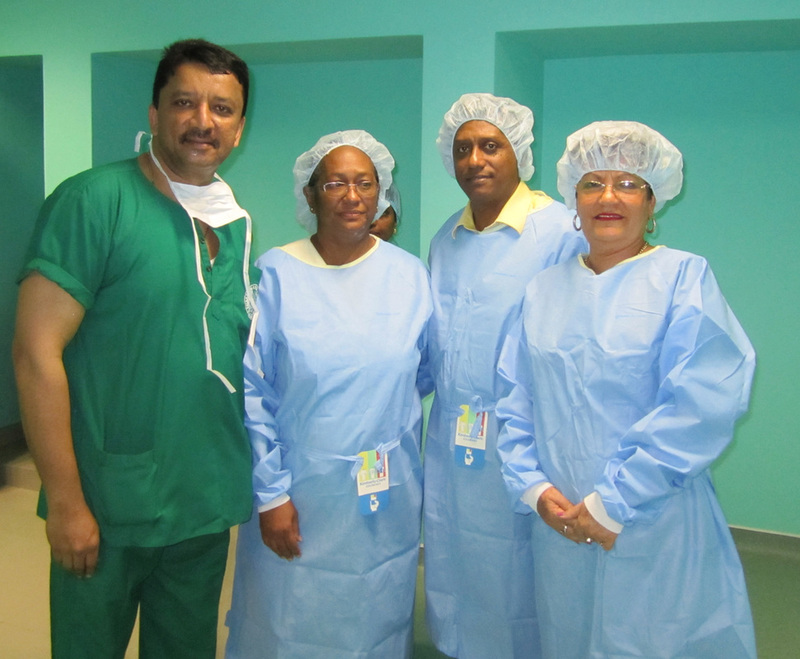 This year, Maxillofacial Surgeon Dr. S.M. 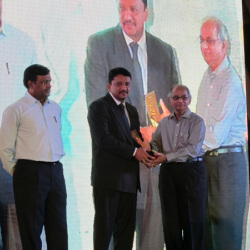 Balaji was honored & awarded by Prof. A.P. Chitre, Seniormost Maxillofacial Surgeon, at a function held in Mumbai. 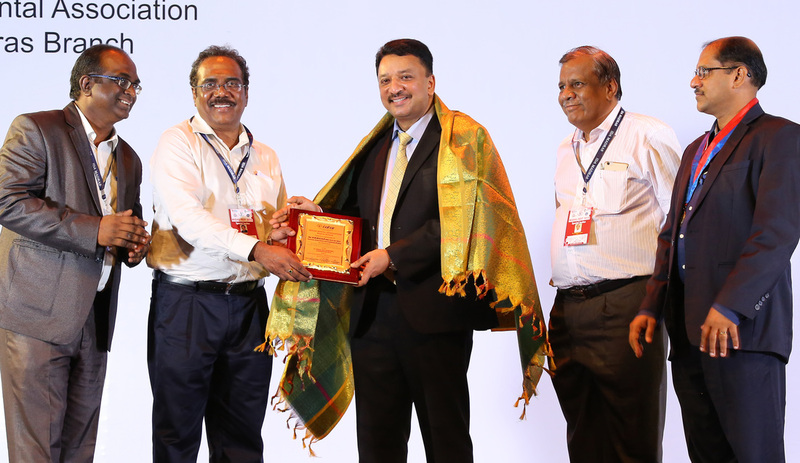 This Award was presented to Dr. Balaji in recognition of his exemplary success in the field of Maxillofacial surgery and research works.